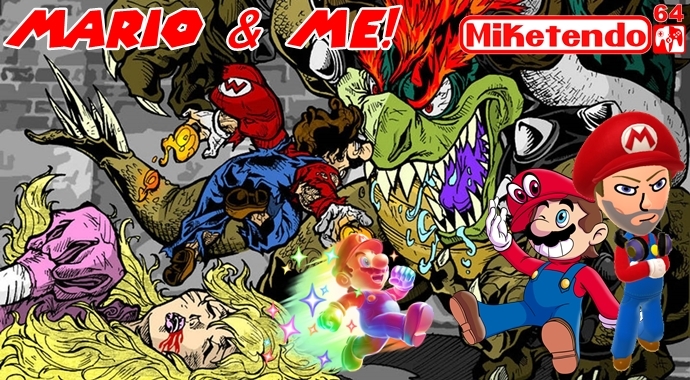 In case you missed the memo, at Miketendo64, this week is #MarioWeek and this is Mario & Me! Our latest mini-series of interviews where developers, Miketendo64 staff and even Friends of Miketendo64 reveal just how much Mario means to all of us. Q1. Name and/or Known Alias? Kristen or Kris. Q2. First Mario game you played? Super Mario RPG: Legend of the Seven Stars. Q3. Last Mario game you played? Mario Kart 8 Deluxe. Q4. Favourite Power-up? Cape Feather in the old-school Mario games, Propeller Mushroom in the newer games. Q5. Least favourite Power-up? Mini Mushroom. Q6. Favourite Boss Battle? Smithy, the final boss in Super Mario RPG: Legend of the Seven Stars. Q7. Least favourite Boss Battle? Crystal King in Paper Mario. Q8. Mario or Luigi? Luigi. Q10. Metal Mario or Rabbid Mario? Metal Mario. Q12. Goombas or Koopa Troopers? Koopa Troopers. Q13. Super Mario Odyssey, physical or digital purchase? Physical purchase. Q14. Playing Mario alone, or with a friend? Depends on the game, really. But I generally have Rachel hanging out with me, so with a friend. Q15. Super Mario 64 and Super Mario Sunshine, or Super Mario Galaxy 1 and 2? Super Mario 64 and Sunshine. Nostalgia, art, and friendship, as corny as that may sound. Mario was one of the first video game franchises that I ever played, along with the Donkey Kong and the Legend of Zelda series. As a kid, I would constantly bother my (very patient) uncle to play video games so I could watch, and Super Mario RPG was a favourite of both of ours. My older sister used to dabble in playing the games as well, helping to introduce me to gaming while we bonded. She may have outgrown them, but I was able to rope my younger sister Rachel into joining me in my gaming life, and I’m so thankful for how close we are due to video games. My love of video games has grown not only due to how much fun gaming is, but also due to the imagination and talent that is poured into them. Video games have sparked my own creativity, influencing my art, both writing and visually. I never would have started writing if I had never been introduced to Mario. Mario and video games in general has also helped me socially. Even if only a few of my friends growing up had their own consoles, everyone knew Mario. Mario Party and Super Smash Bros. games were a highlight whenever my friends and I were hanging out at my house. Being part of the generation that grew up with the rise of the Internet and social media, Mario has also helped me connect to some absolutely amazing people online, and I will forever be grateful for that. When I was a child and learning to play video games on my own, I remember how terrified I was during the part of Super Mario RPG in Nimbus Land when Mario needs to pretend to be a statue. Dodo was doing a “check” on the statues and, for some reason, I was always super nervous whenever I got to that point. I remember how proud I was of myself that one day I determinedly beat that part! Pushing through my nerves at that point enabled me to go on and beat the game myself for the first time. Aside from little goals like that, I will always fondly remember my older sister and I going head-to-head in the two-player port of Mario Bros. that was on Super Mario Bros. 3, along with my younger sister’s excitement at defeating her first Mario game as well. Probably playing with the dog that they showed in the trailer, haha! I’m honestly mostly looking forward to the music. While I’m positive Odyssey will be a great game, the last 3D Mario game that I was actually impressed with was Super Mario 64. Sunshine and the Galaxy games were not favourites of mine – they couldn’t hold my attention that well. Yet, they all have amazing music, and I love the lyrical themes that Nintendo has given Odyssey so far!